I had the pleasure of attending a talk by Doug Brooks at Carpenter's Boat Shop in Pemaquid, Maine, last month. Doug is a highly accomplished builder of both Japanese and Western traditional boat type replicas, whom I wrote about previously. He spoke mainly about the building of the Japanese tub boat, known as a taraibune, and about the state of traditional boat building and the apprenticeship system in Japan. I'll try to get to the big picture later, and will concentrate on the taraibune itself here. 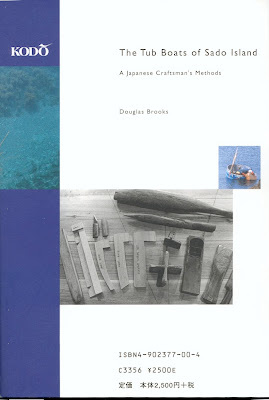 Content comes from Doug's talk, and from his book, The Tub Boats of Sado Island: A Japanese Craftsman's Methods. Taraibune are used for nearshore fishing and seaweed collecting. (Although the term taraibune is recognized throughout Japan, on Sado itself, the boats are called hangiri. ) In spite of their ancient appearance, they date from only the middle of the 19th century, according to Toshio Sato, who wrote the history chapter in Doug's book. Prior to that, dugouts and plank-built boats were used to collect the rich shallow-water sea life around the southern tip of Sado Island, but in 1802 an earthquake changed the area's topography, opening up a multitude of narrow fissures in the rocks along the shore into which it was impractical or dangerous to take long, narrow boats. Derived directly from the barrels in which miso is brewed, tub boats proved to be adept at navigating these narrow waterways. Indeed, they can be easily spun in their own length. Taraibune are traditionally propelled by sculling with a single paddle passed through a simple rope loop at the "bow" of the boat. (The ends of the oval boat are identical, so it is this simple oarlock that defines the bow.) In one village, taraibune fishermen now use small outboards, but interestingly, the stern-mounted engine is not used for steering: this is still done with the paddle, serving as a bow-mounted rudder. In the other villages where taraibune are used, the paddle still reigns for both steering and propulsion. 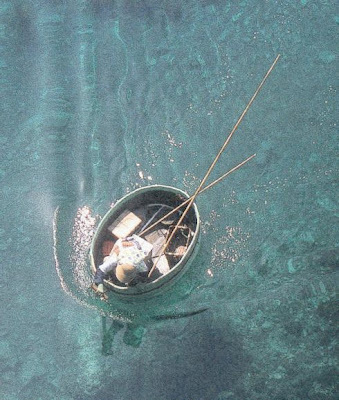 A key tool of the taraibune angler is the glass-bottomed box which is floated alongside the boat. This enables him (or more frequently, her) to clearly see the bottom in shallow water to identify likely prey or harvest. A variety of long-handled tools is trailed behind the boat -- to collect the fish, shellfish, or vegetation at hand. An interesting analog of the taraibune is the Chinese hu-ch'uan or "Kettle Boat." This is perfectly round, not oval like the taraibune and, according to G.R.G. Worcester, in The Junks and Sampans of the Yangtze , it is paddled from the side, not over the bow (although I cannot imagine how this would make the boat go anywhere other than 'round and 'round, in place). Only about 3' in diameter, the hu-ch'uan is used to tend cultivated edible water plants in flooded fields. Doug Brooks' book, The Tub Boats of Sado Island, in both English and Japanese in the same volume, is available directly from Doug, but not on Amazon. "As we closed in on the sambuk [a common two-masted dhow of the Red Sea, Gulf of Aden, South Arabia, and East Africa] I could see that some action was about to take place. The crew, rising off their haunches, casually sauntered to working positions; one right up int he bows at the mains'l tack, four at the shrouds, two to the yard's backhaul and a small group ready to handle the main sheet. These were the action stations for wearing ship, the preliminary operation for sailing on the opposite tack. When the critical moment arrived the helmsman threw over the wheel to bring the wind aft and the big mains'l was allowed to fly forward with the release of its sheet. Every member of the crew now came into action to carry the operation through. The two shrouds that had been taut to windward were eased off and the other pair set up on what was already becoming the new windward side. The yard, which had been freed from the masthead by letting loose the parrel, was at the same time hauled momentarily by the foot, so allowing it to pass over to the forthcoming leeward side. The flying sail was then hauled back and sheeted home on the opposite side to where it had been. it filled out and the sambuk was away on the new tack. "Surprisingly the operation of wearing ship was not a long or very difficult procedure. 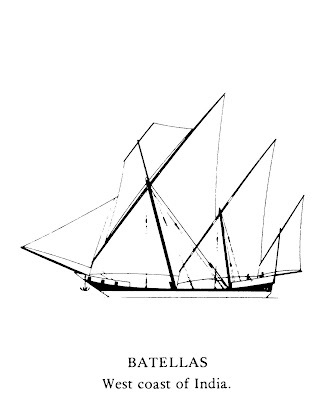 The dhow turned unhesitatingly on its heel and was away on the new board with the loss of very little ground. It is possible for a dhow to go about, head to wind, but in doing so it would be in a somewhat similar position to a square-rigged sailing vessel caught aback with the great settee sail afoul of the mast and rigging. In an emergency a dhow could sail, after a fashion, like this and there is in fact one vessel, the Tuticorin thoni [a three-masted, Indian dhow], that habitually sails with the yard on one of its masts slung to port and the other to starboard so that one sail is alternately pulling free or is afoul of the mast as the thoni tacks. 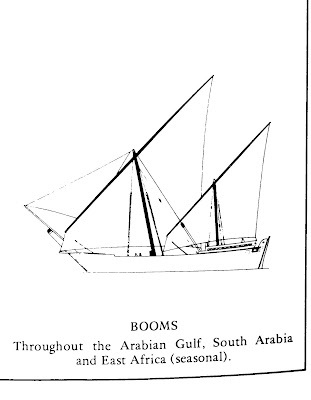 The thoni has an entirely unorthodox manner of setting up its rigging and it is this that allows the vessel to tack and not wear as other dhows do." 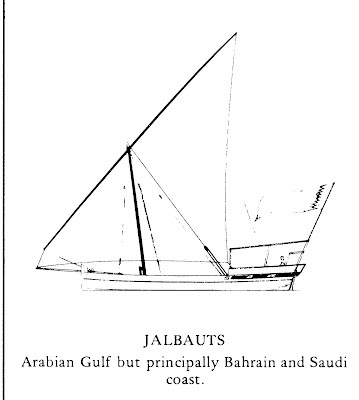 By the way, two-masted dhows all appear to be "ketches," with their mainmast in front. 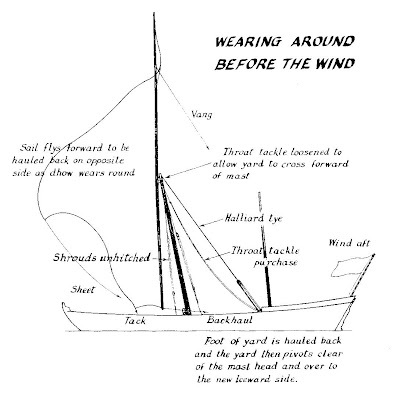 Hawkins shows no schooner dhows in his book. 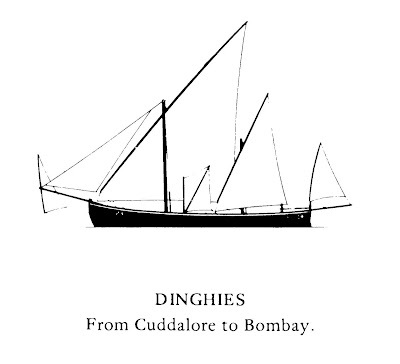 Below are just four of the 28 or so dhow types Hawkins documents; they are mostly distinguished by their rigs, but other differences include their size, the shape and rake of their stem and sternposts, by whether they are transom-sterned or double-ended, and a number of other characteristics. A birch bark canoe of Penobscot Indian design has been built by a team led by Steve Cayard on the grounds of the Penobscot Marine Museum, Searsport, ME. The project took two weeks and resulted in a very fine craft. See over 100 photos documenting the process here. The canoe will be launched at the Maine Boats, Homes & Harbors Show in Rockland, ME, August 7-9. Exact time and date are to be determined.